This year for Pride month, we wanted to revisit a topic that’s long interested us — the relationship between cis male family members and their transgender brothers and sisters; sons and daughters; and various permutations of extended family (cousins, grandchildren, etc.). 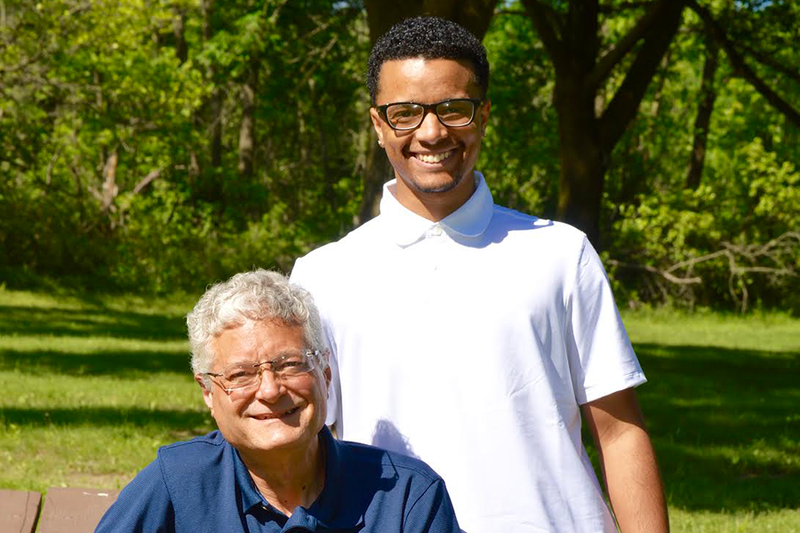 And so, every week in June, we’ll be spotlighting one such family as part of a series of conversations we’re calling “Proud Families.” This week: Sixty-year-old Robert Gauthier and 27-year-old Dezjorn Gothier, a father and son in Waukesha, Wisconsin. After graduating law school last year, Dezjorn has dedicated his time to his own nonprofit organization for youth and is an occasional substitute teacher in inner-city schools. He lives with his wife in Robert’s childhood home, where they’ve begun caring for foster children and continue their love of “handyman” projects. Dezjorn: I was very tomboyish as a kid. I would do things society would typically deem masculine — digging around in the dirt, playing sports and dressing like a boy. I was a “daddy’s boy,” even though I didn’t see my dad a lot because of my parent’s separation. But because I mostly lived with my mom back then, my dad and I both always made the most of our time together. There were custody and legal issues, so I had this sense of not knowing if I’d be able to see my dad the next day, which made me keep him really close to my heart. Robert: I was taught by my own dad that you always have to be there for your kids. Kids come first. I wouldn’t see D for a long time during different periods of my separation from his mother, but I always enjoyed being with him. I remember when she was little, the washing-machine repair guy came over. As soon as he took out his tool box, D was there with his tools, too. He wanted to be the repair guy. He wanted to take his shirt off. He wanted to be Tarzan. You’ll notice, I used to use “she” when talking about D’s childhood. I always use “he” when talking about the present and the recent past, but for a while, when I thought about those old memories, I still thought “she,” because D grew up for many years as a little girl. We had an understanding about that. Dezjorn: That’s unique to our family. My community often struggles with family members misgendering them during the early phases of our transitions. I understand where my dad was coming from. I did a lot as a girl, so when he used to think back to that time, he saw his little girl. He often corrected himself though. It’s a process. Dezjorn: As a kid, I was definitely taking cues from my dad all the time. I looked up to him and mimicked him. I wanted to learn how to tie a tie if he was wearing one. My maternal side was strict. I had to wear dresses. But my dad completely allowed me to express myself and dress however I pleased. As a little girl, I modeled a lot, so I wore dresses all the time. I was in tons of beauty pageants, which I liked, especially the public speaking part. So I wasn’t offended by the dresses. I just didn’t want to wear them outside of the pageants. It’s not like I knew the word “transgender” when I was five years old, but I’d get so annoyed when a cashier or someone would say, “Oh your son…,” and my parents would correct them, “Oh no, that’s my daughter.” I’d be like, “Okay, why’d you have to correct them?” That experience triggered something. I realized I was experiencing something more than just liking girls. As I got older and began researching stuff online, I realized the term transgender was the term that fit me best. But even though this wasn’t too long ago, the internet had way less information about transgender people than it does today. Still, I used the internet to communicate a lot, chatting with my own friends, in particular my best friend from Wisconsin who moved to England and was also figuring out that he was a trans man. He began transitioning, and we’d talk on AOL Instant Messenger all the time, discussing different terms or sharing information. A lot of trans men have a transitioning buddy, someone they went to surgery with on the same date, or began taking testosterone with at the same time. It’s important because you need the support, and a lot of times, you don’t get it from your family, even if they’re generally supportive. They just don’t get it. Robert: That’s true. I’m still learning. But I did have one transgender friend before D came out to me — Janet. I went through this process with her, too, as she transitioned from male to female. I first knew Janet as James. A very Indiana Jones-like person. An independent world traveler and adventurer living in Wisconsin. I was shocked when James transitioned to Janet. I wondered, How could that be? But I told Janet, “You’ll always be my friend. You’re not hurting anybody.” So I’d already learned a little from that experience. Dezjorn: To be honest, I don’t even remember how I actually told you. Robert: That’s what I was just thinking — did you actually tell me? It just evolved. It became clear. Dezjorn: But when it came to changing my name, we had a discussion. Robert: Well, it wasn’t really a discussion. You were telling me. Robert: Well, I didn’t say Dezjorn. Dezjorn: I know you didn’t. I was 18 and almost done with college. Basically, I’d been cast in a 2014 Barney’s campaign featuring all trans people, shot by the legendary photographer Bruce Weber. I knew the magazine spread was coming, and that it was going to be my way of coming out to even more of my friends and family. Everything was moving quickly, and I didn’t care what anyone thought. I wore Balenciaga. The ad was in Vogue and Vanity Fair. Robert: I thought that was cool. I’m really proud of that. I was telling everyone, “Hey, check out my son in Vogue!” The funny part is, some people probably walked away from that going, “Wait, didn’t he have a daughter?” But nobody has ever said anything! Dezjorn: Before that campaign, I planned to go stealth. I was going to transition, but not draw any attention to the fact that I was a trans man. I was just going to start identifying as a man and keep that part of it private, especially since my beard had begun growing and I was physically looking more masculine. But the emphasis of that campaign was the transgender community. It made me realize that it’s important people know we exist. If we’re all stealth, we’re all a secret. Plus, I wasn’t raised to be afraid of who I am. I’m lucky in that way, and because of my privileges, I can be the outspoken advocate I am today. I’m a proud black, trans man. Even though society marginalizes people like me — or tries to — I don’t think of myself as a victim. Robert: I always said, “Don’t run around saying, ‘Oh poor me.’” Fix it. Dezjorn: Another big piece of my identity is being Catholic. My dad doesn’t have religious affiliations, but my mom raised me very Catholic and I’m still part of the church today. As I came into my trans identity, I thought, This isn’t going to work in the Catholic church at all. I didn’t feel like God made a mistake, but I worried about “playing God” by making changes to myself. So I waited a while before medically transitioning. Then I realized that even if I didn’t make a single surgical change to my body, I’d still be a trans man. I’d already begun medically transitioning when I was confirmed Catholic. I didn’t think the church would let that happen, but it was the parish at my university that went along with it without saying anything. They maybe wouldn’t admit they knew what was going on with me, but they did. I got the confirmation name “Gabriel,” a male biblical name, and you know, as they said it as I walked across the stage in church, I thought, Yeah, I’m going to be all the way out about this. That’s when I started correcting friends and family and emailed all my professors telling them what was going on. Robert: Didn’t we have matching suits and ties that day? We like to match a lot. Dezjorn: I want to advocate now as a trans man and be like, “Look at this. Look at how long I’ve been in this church as an LGBTQ person.” I’d love to meet the pope. But no, I don’t bring up my gender to priests during confession. What do I have to confess? “Sorry God, I’m trans?” No, I’m good with God. Robert: God created everything. God created D. There’s no issue there. Dezjorn: Has anyone ever talked down to you because I transitioned? Have they questioned you about “letting” me do this? Robert: No, I wouldn’t allow it. I don’t allow people to talk down to me about anything, especially my child. The reality is, I don’t support D. I walk by D’s side. D is strong enough to support himself. Dezjorn: What’s been your inspiration for parenting me the way you do? Robert: Mostly from my own parents. My dad lived through the Great Depression. I’d watch him help people all the time, even if in the end, he got burned. He treated people well. My mom worked before it was common for women to work. My siblings and I grew up being there for one another, no matter the amount of fighting. Then I spent 33 years working in corrections. Outside of work, there was a group of us called the “Bros,” and the women were the “Bras.” We’d all go on extended camping trips full of adventure — whitewater kayaking and throwing knives and hatchets. We were into that macho stuff, but the guys I respected were always extremely fair. Besides, I always had this sense that I was different, too. I’ll never follow a specific path. I’ll be that odd guy. I’ll be that underdog. People learn to live with it. They go, “That’s just Bob. He’s weird.” I’ve always done my own thing, and that’s what I want for D, too.